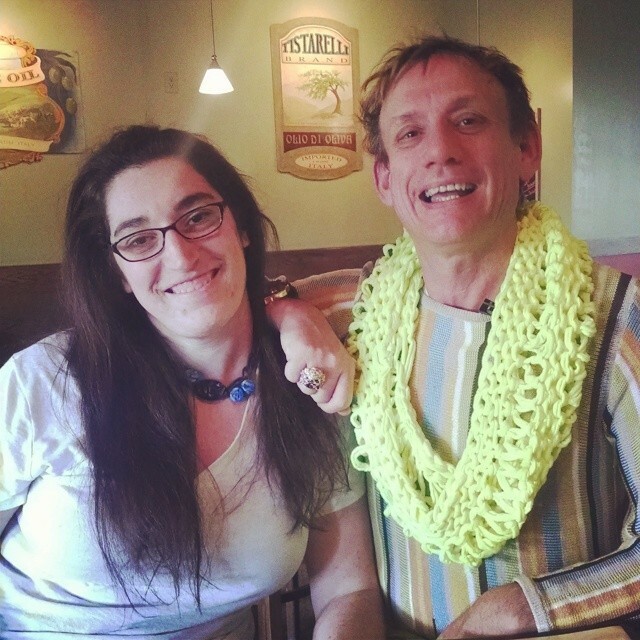 Festing, Weaving, Goatlove and the Glitter Diva- Minnesota Anyone? I have been planning a trip back to Minnesota for awhile, and I had SO much fun once it happened!! Ten packed days of fiber, weaving, baby goat snuggles and more fiber with the one and only StevenBe!! FiberDivas Unite Indeed!! I went to college in Minneapolis, and I love to get back there!! This time I was able to wrap up family time with loads if fiber fun!! We arrived and set up our booth at Shepherd’s Harvest Fest! 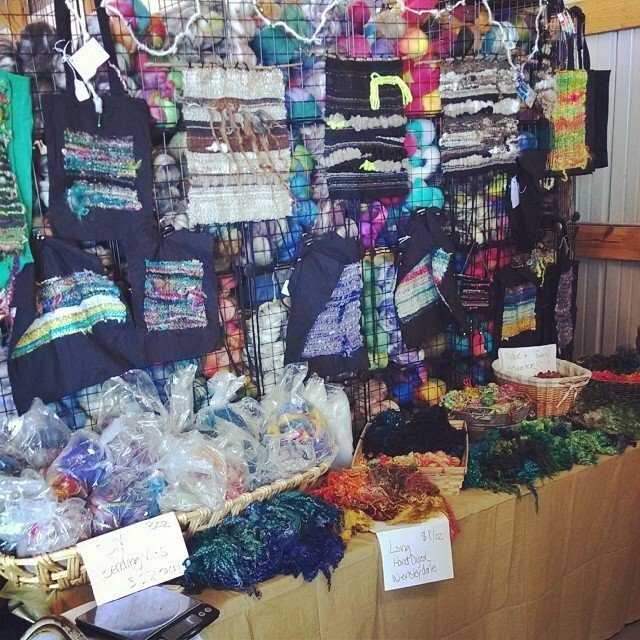 This is a great fest that’s way bigger than I imagined, with 4 barns full of vendors and demos! There were animals and a fleece show I missed (sad panda) but I still managed to come home with 5 amazing bfl cross fleeces!! Thanks to some good friends who lent me a few gridwalls and tables, and the amazing Steven Berg of StevenBe fame who let me raid his shop basement for a super fun mix of baskets and other fixtures.. even a silver wicker dressform.. I was able to tie a nice booth together!! 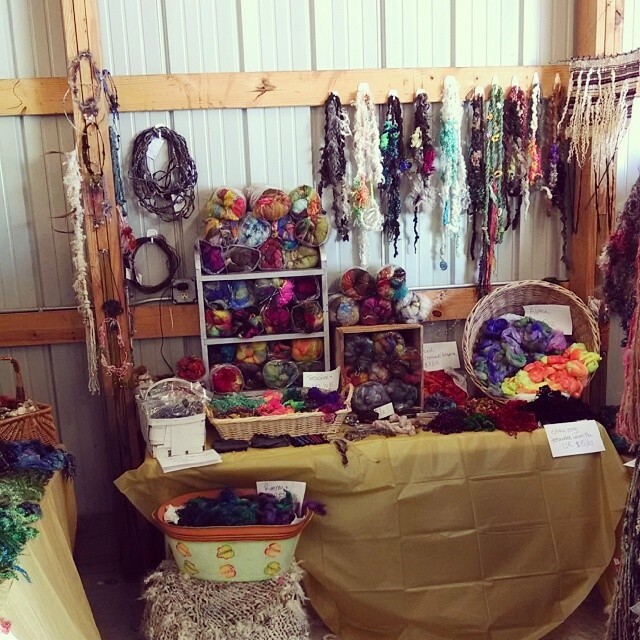 I had a great selection of yarns and fibers and LOTS AND LOTS of locks!! It was so fun to meet new customers and hug old friends!! On Wednesday I spent the afternoon at one of my favorite farms. Red Falcon Ranch breeds for the most amazing colored mohair. They also have lovely white, but there’s nothing like their color. I got to visit the kids and put dibs on my fleeces for the fall shearing!! These were the most amazing little babies, who just crawl into your lap and love ear scratches and nose nuzzles. These are the most amazing families.. mamas call and the babies come nurse, then they fall asleep together. I’m always amazed at animals and how deep their love is. 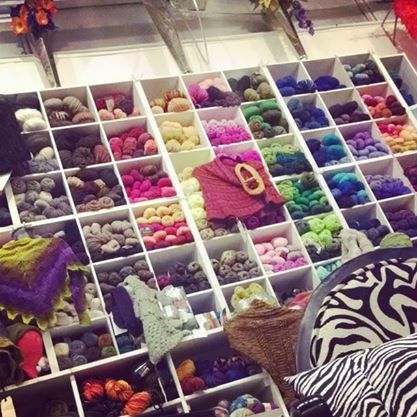 On Thursday the fun moved to StevenBe- a very fabulous yarn shop in South Minneapolis!! StevenBe is actually much more than a yarn shop.. it’s an experience! 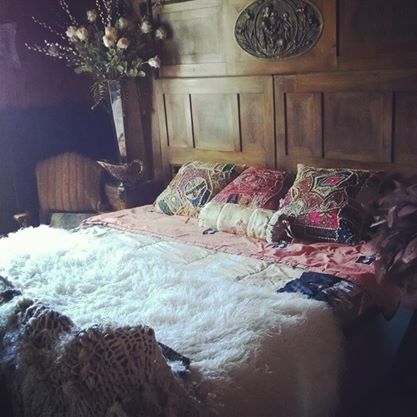 Housed in a converted firehouse- complete with zebra print and crystal chandeliers- and there’s yarn from floor to ceiling- all KINDS of yarn.. even a killer HABU stash!! 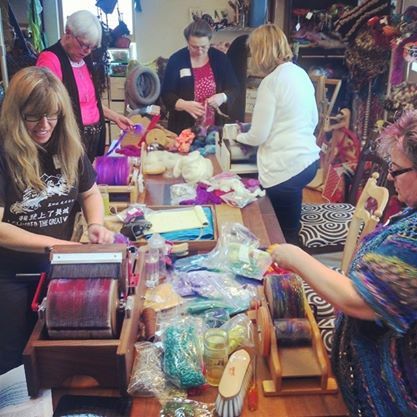 And along with yarn, there’s a new fiber studio upstairs with LOADS of fiber and other goodies The upstairs studio is an “undiscovered” treasure for spinners and fiber enthusiasts. There are stashes of luxe fiber like cashmere and yak, there’s solids to mix and match, and plenty of batts (by yours truely) and other indie artists! Like Steven’s yarn collection downstairs, upstairs is a fantastic collection of treasures Steven has collected on his travels- and by treasures, I mean buttons and notions and knick nacks OH MY!! We started the weekend with a luncheon and trunk show!! Then we continued the day with a full fiber prep class!! 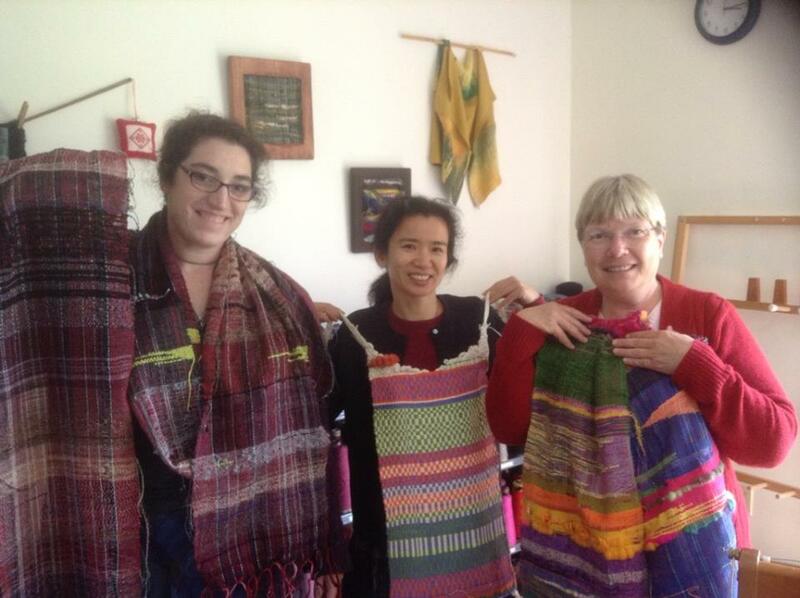 The class members were thrilled with soffsilk samples by camaj, as well as the other goodies Steven and I had for the group! After class that night, Steven and I went out for a lovely dinner and he brought me back to the yarn shop to spend the night.. That’s right folks– I GOT TO SPEND THE NIGHT IN THE YARN SHOP!!!!!!!!!!!!!! Oh yes!! I may or may not have rolled around in all the glorious yarn around midnight… Oh.. and the bedroom.. fit for the most fabulous of course..
Friday and Saturday were filled with the same fibery fun at the yarn shop.. we spent the days plying and plying again. We spun on wire and elastic and wore our newly spun creations! Must thank Natalie from Cloudlover Fiber for the beautiful braids of fiber!! I have found a fiber superfriend in Steven Berg.. and I see myself coming back to his shop regularly for mahyem and hijinx!! First request- a dye workshop!! Hoping to make that happen this winter… we’ll see how things work out!! I’ve been home a few weeks.. new batts have been added to the shop and I’m working on a small handspun update tonight and tomorrow. 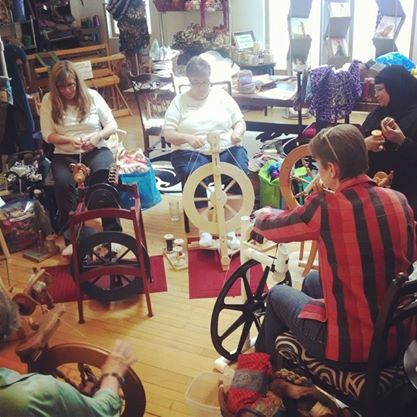 There are still a couple spots open for the spinning and weaving weekend this upcoming weekend in Oxford CT, and registration is filling fast for the weekend at PortFiber in Maine in July. 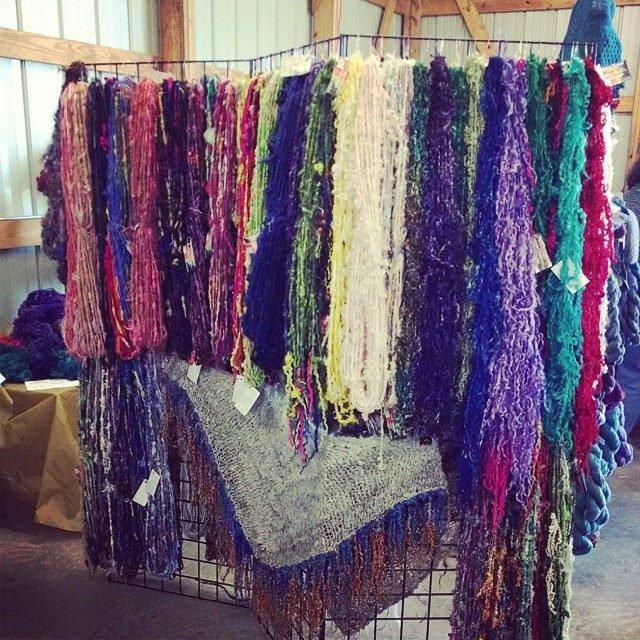 Of course Rhinebeck classes are open and TWIST registration opens July 1. It’s shaping up to be a fiber fun year!! If you want to meet Steven yourself, check out his tour with Stephen West! They are traveling all around the US for the next couple months, so they might come to a shop near you! They’ll be coming through NC in July and you’ll see me there!